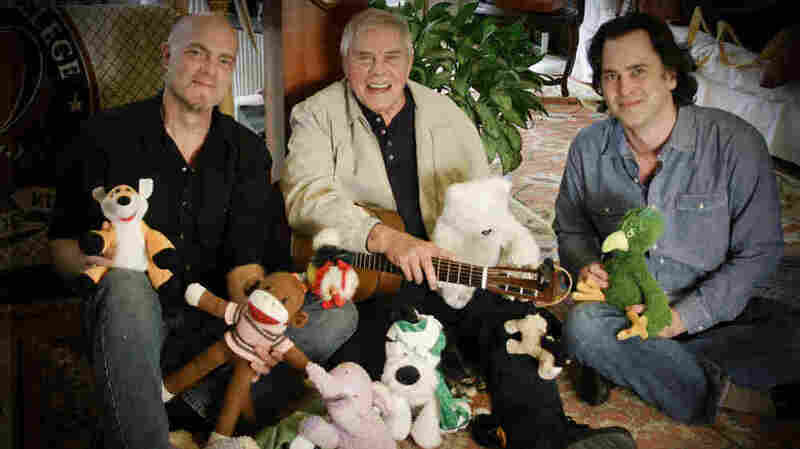 Nashville Revisits An Unlikely Children's Classic Almost 40 years ago, celebrated country singer-songwriter Tom T. Hall surprised his record label by creating a children's album, Songs of Fox Hollow. Now, Hall has teamed up with some of Nashville's independent roots-music scene to remake the time-tested classic. Tom T. Hall, flanked by producers Eric Brace (left) and Peter Cooper. The three worked together to remake Hall's children's classic, Songs of Fox Hollow. Singer Tom T. Hall earned the nickname The Storyteller for his mature, literary approach to country songwriting in the 1960s and '70s. When children figured into his songs, they were usually part of adult situations, like the girl who learns about small-town hypocrisy in "Harper Valley PTA." But one summer in 1974, Hall found himself writing songs for children. The album that resulted, Songs of Fox Hollow, became a cult classic. Now, that record has been remade for a new generation by a group of appreciative Nashville musicians. Just over some hills from one of the Nashville, Tenn., area's biggest malls and highway interchanges, Tom T. Hall's estate, Fox Hollow, feels like 100 years ago and 1,000 miles away. Surrounded by acres of forest and two ponds, the stately home is guarded by pet peacocks. Hall and his wife, Dixie, bought the house and land in 1969, when he was at the height of his hit-making career. Since then, it's been a sanctuary in every sense of the word. "We made a promise to never shoot a gun on the property," Hall says. "And now, when the hunting season comes, all the huntable things move into Fox Hollow and gather up pretty much around the house. We wake up some mornings, and there are 15 or 20 wild turkeys in the yard." Fox Hollow has proved to be a refuge not only for animals but for songwriters and children as well. Nearly 40 years ago, Hall explored the property with two young nephews who had come to stay for a summer. "So we spent three months walking around Fox Hollow, and they were discovering things that I hadn't spent much time on or maybe wasn't paying attention to," Hall says. "One day, we saw a little snake go wiggling off through the water — a little garden snake of some kind. We named him 'Sneaky Snake' and made up a story about him hugging and kissing and drinking root beer." After the kids went to bed, Hall set the story to music. Soon, he had a full album's worth of similar songs. Hall's record company was taken aback when he told them his latest work was a bunch of kids' music, but nevertheless, he was allowed to record and release it. The new song-for-song remake is titled I Love: Tom T. Hall's Songs of Fox Hollow. In all, there are more than a dozen leading artists from Nashville's independent roots-music scene, including singer-songwriters Jim Lauderdale, Elizabeth Cook and Bobby Bare. They were brought together by Peter Cooper, a music reporter for the Tennessean newspaper, a touring songwriter himself and a superfan of Tom T. Hall. Cooper says the album came out when he was 4 years old, and that it has continued to be a part of his life. "I was playing 'Sneaky Snake' in a band in college," Cooper says. "It's not an album that adulthood necessitates giving up. The songs are layered, and songs like 'I Love' and 'I Care' were adult hits." In fact, both songs reached No. 1 on country radio. Even "Sneaky Snake" made the charts and became a popular CB radio handle, a fact that astonishes Cooper's co-producer, Eric Brace. "These days, it would be hard to imagine a long-haul trucker singing along to Barney the dinosaur or a Hannah Montana song," Brace says. "But in 1974, when Tom T. put out Songs of Fox Hollow, subtitled 'Songs for Children of All Ages,' that's what happened. It had those two No. 1 country hits, and I love imagining that truck driver tearing down the highway going, 'I love little baby ducks.' "
Now, almost 40 years after truckers sang along to "I Love," Cooper and Brace have recruited Austin songwriter Patty Griffin to sing the hit. The producers also recorded interviews with musicians during the sessions, including Griffin. "Tom T. is a songwriting master," Griffin says, "and he got a lot of that stuff right on target with me — the little fuzzy pups and the coffee, especially." The sessions took place over several days at Fox Hollow, where Hall and his wife keep a studio. As for the songs themselves, they came into being in the first place because The Storyteller wanted to try a fresh point of view. "It was something I wanted to say that I'd never had an excuse to say before," Hall says. "I think most entertainers are childlike anyway. Entertaining is a childlike thing. It's a frivolity. When I started following these kids around and I saw the world the way they did — and I'm being selfish about this — I didn't write this album for my nephews, and not for kids in general. I just wrote it for myself. The child in me, you might say, if that's not too poetic." Too much poetry from Tom T. Hall? That's as far-fetched as a root-beer-drinking snake.